Gardner, D., & Miller, L. (2013). The management skills of SALL managers. Studies in Self-Access Learning Journal, 4(4), 236-252. This paper looks at the management skills of SALL managers. It is based on data collected using quantitative and qualitative instruments with six SALL managers in tertiary contexts in Hong Kong. With reference to the literature in the field of management, the paper reviews the data in terms of identifiable management skills. This provides a picture of the skills possessed by these managers and also identifies gaps in their skill-sets. The paper provides a checklist of skills relevant to SALL management which individual managers may find useful, and also discusses the 4 key management areas of leadership, scope, expectations and evaluation. 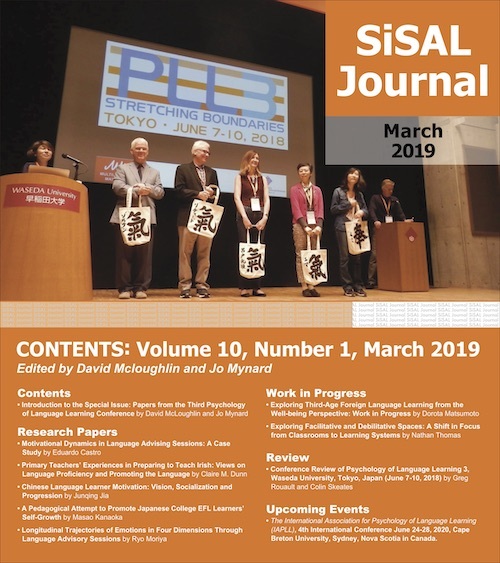 Self-Access Language Learning (SALL) has grown and matured into a respectable sub-section of the field of applied linguistics and there is evidence that the number of self-access facilities continues to grow (see Gardner and Miller, 2011 for a summary). Given the financial, human and material resources invested in SALL, it is surprising that so little attention has been paid, in the literature, to its management. Management is relevant to SALL at all levels, and in all its variety, from large dedicated self-access centres to smaller implementations in the classroom. While the general literature on management is extensive, it predominantly deals with management at higher levels, especially in the educational sector. The management of SALL, however, tends to meet the criteria of middle management, and, unfortunately, the literature dealing with middle management is considerably less rich (Busher, Hammersley-Fletcher & Turner, 2007), is less often research-based (Briggs, 2005) and tends to be practical. In a study of tertiary level self-access centres, Gardner and Miller (1997) define the managers they looked at as middle managers because of their liaison functions of maintaining a flow of information between departmental managers and their staff. Briggs (2005) also refers to this liaison role of middle managers in a tertiary setting, while, interestingly, Bennett, Woods, Wise, and Newton (2007) found that secondary school middle leaders manage through interpersonal relationships and collegiality rather than through monitoring. 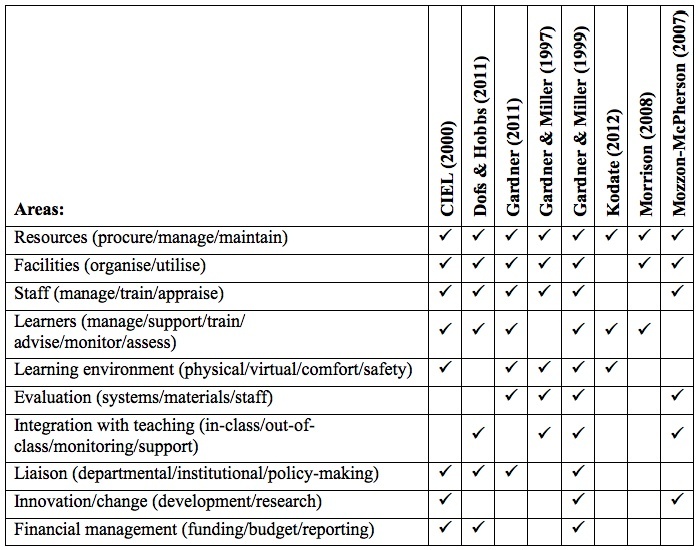 Within educational contexts, middle managers seem to straddle the communities of practice of their departments and those of senior management (Busher et al., 2007). In another study, Gardner and Miller (2013) identify a well-established community of practice amongst SALL practitioners to which SALL managers belong, but they also note a young and emerging community of practice consisting uniquely of SALL managers. Such evidence seems to suggest that the role of the SALL manager is now more clearly defined and is distinct from other roles related to SALL, raising questions with regard to the type of training required for SALL management. To identify the training needs of SALL managers, it is important to understand the skills that they need to access and the role that they perform. This paper examines four key areas of this role: leadership, scope, expectations and evaluation. The importance of these areas emerges from the general management literature (with regard to leadership) and from the SALL literature (with regard to scope, expectations and evaluations). Leadership and its relationship to management is discussed at length in the literature, but this paper will adhere to the traditional view that managers tend to maintain the status quo and hold their authority by virtue of rank, whereas leaders bring about change and gain authority from respect for their vision (for a fuller discussion on these issues see, among others, Bush, 2011; Jameson & McNay, 2007). Both leadership and management (in the above-mentioned traditional sense) are important parts of what we will hereafter refer to globally as ‘management’. The scope of a SALL manager’s purview is increasingly wide and variable, and may encompass self-access centres, virtual SALL and SALL within taught courses. This may result in broad and potentially overlapping duties (see Table 1 for a view of the potential duties of a SALL manager). Managing the expectations of stakeholders (students, teachers, heads of departments and senior management) can be a large part of a SALL manager’s role because SALL may not be within the stakeholders’ past experience. This requires the building of face validity (Toogood & Pemberton, 2002) and user confidence (Young, Hafner & Fisher, 2007), demonstrating effectiveness (Gardner, 2002), recognising teacher-expertise where it exists (Morrison, 2008; Mozzon-McPherson, 2000) and where it does not exist, providing support (Lai, 2011; Lai, Gardner, & Law, 2013). Managing the evaluation of SALL is a way of monitoring progress, demonstrating success and concomitantly securing, justifying and maintaining funding (Gardner & Miller, 1999; Morrison, 2008), but it is complex (Morrison, 1999; 2006). 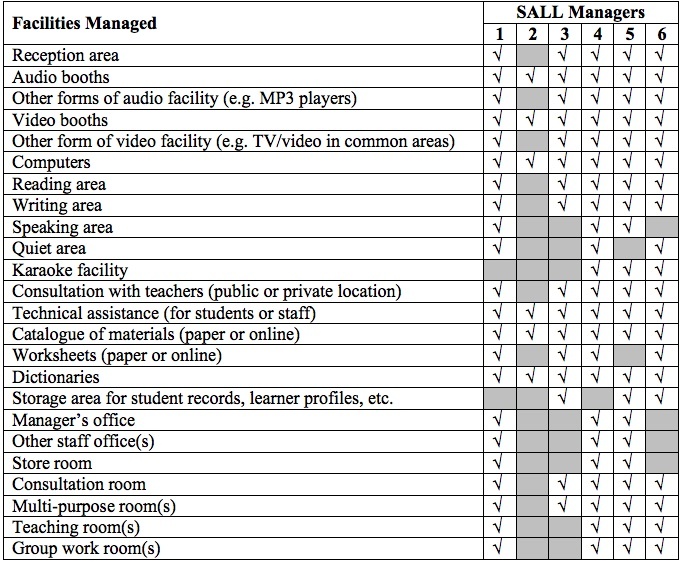 Nevertheless, from the relatively small amount of discussion in the literature, and from the even less data-based research available, it is possible to identify some specific common areas (see Table 2) concerning the SALL manager’s role. Examination of the business and educational management literature shows the importance given to management and the emphasis placed on management training. Surprisingly, however, there seem to be no specific training opportunities available for SALL managers, nor is there much attention paid in the literature to the need for it. Gardner and Miller (1999) suggest the following ten areas in which SALL managers could benefit from training: managing systems, institutional procedures, financial, appraisal, counselling, evaluation, staff development, negotiation skills, planning, and public relations. While it is clear from the literature (summarised in Table 2 below) that these areas are important for the effective performance of the role of the SALL manager; nevertheless, they remain largely unaddressed. It is for this reason that these areas of potential management training were investigated in the study reported here. The collecting of data directly from SALL managers makes it possible to ascertain the degree to which there is a gap in their training needs. The research data, on which this paper reports, were collected using questionnaires, checklists and interviews, from six SALL managers in tertiary contexts in Hong Kong. The data contributed to individual case studies of each manager. The research originally targeted the eight main tertiary institutions in Hong Kong, but the data from two of them were incomplete and are thus not used in this paper. The data presented here focus on one main area of what was a larger project looking at various aspects of SALL management. Fuller information about the whole project is reported elsewhere (Gardner & Miller, 2011, 2013). Although the six participants were clearly identifiable to us as ‘managers’, they were not all identified with this title within their institutions (see Table 3). The self-access centres which these managers were responsible for were often housed within larger academic units (usually Language Centres) and all the managers had additional roles to play within their centres such as, teaching, course-development, and administration. Step 1: We contacted SALL managers to ask them to participate in a research project into managing SALL. All managers agreed to participate. Step 2: We conducted a literature review to ensure we were aware of issues involved in management in general and educational management in particular. Step 3: We conducted an open-ended pilot interview with someone who used to manage a self-access centre in a Hong Kong university. Step 4: We used our literature review and pilot interview to develop a questionnaire related to the main issues about managing SALL. Step 5: We sent the questionnaire electronically to each manager with a request to complete and return it to us at their convenience. Step 6: We reviewed the completed questionnaires to identify key issues and areas of concern. These fell into general areas relating to all managers and specific issues relating to the individual. We constructed checklists for the former and identified key questions for the latter. Step 7: We interviewed each SALL manager using our review of their questionnaire responses as a starting point for discussion. During the interviews we also used the checklists to gather further data on general issues. All the interviews were recorded, transcribed and analysed. The data reported in this paper come mostly from Step 5 and Step 7 of the above procedure. Step 6 was an important part of the procedure because it allowed us to individualise the interviews (Step 7) on the basis of managers’ earlier questionnaire responses (Step 5) but also to pursue topics relating to all managers. One area of interest we pursued with all managers was that of management skills. We looked for any experience they might have in management before taking on the role as SALL manager, and what types of skills they felt they had needed to develop in order to do their jobs effectively. We also asked if the managers thought there were skills they needed, but currently lacked. It is the data we gathered in this area that are the main focus of this paper. The SALL managers’ responsibilities for human resources (Table 3) are clear in the data from the questionnaires and were further clarified in their interview responses. All of the managers were responsible for running a dedicated self-access centre (SAC) but, as can be seen from the table, each institution had a different approach to how they staffed their SACs. In all cases, managers were responsible for dedicated administrative staff, although the level of this support varied considerably. Managers were also responsible for teaching staff, but this ranged widely from dedicated staff, to part-time and even volunteer staff. It is interesting to note that not all of the people we identified as managers were given the title of ‘manager’, a point we shall return to in the discussion, but all had responsibility for directing and managing staff. The SALL managers were also responsible for facilities management. We have tabulated, for easy comparison, the facilities managed by the SALL managers at the time of interview (Table 4). These data are based on the use of a checklist during the interviews (Appendix 1), further clarification sought where needed, and an invitation to managers to make additions to the checklist if required (no additions were made). It should be noted that SALL provisions change frequently, as student demand and/or resourcing change, and therefore what is presented here can only be seen as a snapshot taken at the time of data collection. It is clear from the table that a wide range of facilities were being managed by all but one of the managers. Given the initial view of the role of SALL managers that emerged from the questionnaire data, we included, in the interviews, an opportunity to collect further data about management skills. We were interested to know more about the extent to which the managers believed they had the skills to cope with managing staff and other resources. To collect these data we used a checklist of management skills (Appendix 2) based on one we had developed earlier (Gardner & Miller, 1999, p. 81) and adapted it to this situation based on our literature review (Step 2 of our research procedure) and the outcomes of an earlier project in a similar context (Gardner & Miller, 1997) which had revealed some need for management training. In the interview, we gave each manager the checklist and asked them to indicate whether they had the skill, whether someone else in the department had the skill, or whether they thought it might be useful for someone to have the skill. We then used the managers’ responses as the basis for further discussion. A comparison of all managers’ responses to the checklist is presented in Table 5. SM4: Finance, yes. I passed book-keeping and also some… From secondary and tertiary, yes. I passed all of these exams…I have (other) paper qualifications… Management systems, yes, I did management courses at university. Negotiations skills, from the English Department, Yes. …Planning… Public relations, yes public relations…I was an information officer with the government for a year and I got formal training for PR work. A second manager, SM6, also had specialised training in management (an MSc in human management and training), although (s)he did not tick all of the boxes. This perhaps indicates that (s)he did not feel comfortable handling all the items identified on the checklist. Three managers said they knew of other colleagues in the SALL team holding specialist management skills. Most went on to say that they would be surprised if anyone in their centres possessed these skills and that most of the skill development of colleagues was based on ‘experience’. In contrast to SM4 and SM6, SM2 thought that (s)he did not possess any management skills as identified on the checklist. This was somewhat strange considering that (s)he was actively involved in managing SALL within the university. However, when we look at the range of facilities SM2 managed, we see that it was limited compared to the other SALL operations. SM2: I think that if we have the opportunity that is more important than training, because even if we are trained if we don’t have a say then we don’t get involved. Given the opportunity, SM2 would like to be more involved and ticked a number of skill boxes on the checklist which (s)he thought would be useful to SM2 personally, if they were offered. The most interesting thing about Table 5 is that not all SALL managers had the same skill-set. In our interviews, most managers said that they had developed their skills through ‘trial and error’, apart from SM4 who had attended several training courses and had many years of experience in management, and SM6 who had a degree in management. It is also notable that the managers did not tick many of the boxes to indicate whether any of their colleagues had these skills. This may be because if the SALL manager did not have the skill then they may have thought that no one else in their centre would have such skills, or they may not know what skill set any of their colleagues held. We were also interested to see that although more boxes had been ticked in the third section of the checklist, not all the boxes were ticked. This may be because if the manager or a colleague already had such a skill then it was not considered necessary for any more training in this area, or, as indicated by SM2, the managers may have felt that even if they had training in some of these areas they may not be able to influence change (e.g. hiring staff, or budgeting) as this activity did not lie in the hands of the staff who worked in SALL. SM1: I picked up most of my skills generally with no formal training. SM3: “counselling staff” I have had an hour or so on it but it wouldn’t be sufficient training. This is the problem with most of this actually. [reading other items] I guess I haven’t really had training, it’s all on the job. [reading and ticking more] I don’t think I’ve really had any formal training in anything. SM5: Negotiations skills. Again, I’m sorry, I’d like to think that I have got a lot of experience in negotiation. But perhaps I need an outsider’s perspective. I don’t have formal training. In the study reported on here, most managers indicated that they did not receive any significant amount of training related to the needs of SALL management. This may be because: a) there are no suitable training courses available for SALL managers to take; b) the senior management at universities may not think training is necessary, or c) the SALL managers’ commitment to their work may disguise the need for further training. However, as can be seen from the data collected in this study, most of the managers we interviewed were responsible for the management of a number of other staff, and for a variety of spaces and facilities. It would be difficult to imagine a similar situation in the private sector where someone was given control of such resources without any form of management qualifications or training. The managers in our study did indicate that they thought some form of training for themselves or their colleagues working in SALL would be desirable. The managers themselves were actually involved in training the staff they managed. As the managers had learned from experience while doing the job, they frequently passed their knowledge on to other colleagues and staff involved in SALL. The managers’ own expertise allowed them to form an emerging SALL managers’ community of practice (CoP) (see Gardner and Miller, 2013 for further discussion on this point). The six managers interviewed in this study were, in fact, ‘experts’ in the field of SALL management and this is made clear by the fact that they knew more about managing SALL than others around them. Given appropriate opportunities, we believe that these managers could contribute significantly to developing a training course for other staff involved in SALL. In this way, apprenticeship, which is an essential feature of a CoP, would be strengthened and this may generate more interest in the management of SALL, and the viewing of SALL management as a form of career development for staff interested in SALL. The current managers were able to identify the most relevant skills they thought their SALL team needed (Table 5). It is interesting to note that the managers did not select all the items on the checklist. For instance, three or more managers did not think it was essential for them or their SALL team to be trained in management systems, appraisal, counselling, evaluation, staff development, negotiation skills, planning or public relations. One reason, as indicated by SM2, is that those working in SALL are often seen as too junior to be involved in more senior level decision-making. It may also be that as each SALL situation is unique, the managers did not think that it was necessary for the SALL team to spend time on acquiring skills which they may not need to use: for instance, if the SALL environment did not offer a counselling service to the students then there would not be any need for staff to be trained in counselling. We have identified four main areas that SALL managers need to be involved in: leadership, scope, expectations, and evaluation. In our study the six managers talked to us about how they were given responsibility for SALL and were expected to lead their SALL team in a variety of ways. Not only did these managers have to take on this leadership responsibility, but they also strived to manage the SALL facilities offered to their students so that the facilities were interesting and accessible. However, leadership is not a natural skill that people possess. We believe that if universities professionalize the role of the managers then their leadership qualities will develop more consistently. The first way to do this is to recognise the role by attaching the title of SALL manager to it. A second approach is to formalize the role by locating it on the salary scale. Thirdly, the role should be identified as a career development opportunity for staff. Most of the managers we interviewed were responsible for managing people, spaces and facilities. The scope of their responsibilities was impressive and even where they were not given direct control of a budget they were, through this role, managing resources of considerable value. Where staff are given such responsibilities it seems good managerial practice on the part of the institution to provide adequate support and recognition of the role. Most importantly, the SALL managers should be given opportunities to develop their existing skills and acquire such new skills as would enhance their ability to perform the role. With an enhanced skill-set the SALL managers could develop their own role and also prepare junior colleagues to move into the management role in the future. This would be best done through the system of apprenticeship integral to a CoP, the first signs of which we see developing in the context of this study. With appropriate training, SALL managers are better able to manage the expectations of students, teachers, heads of departments and senior management. More efficient handling of resources, better understanding of student needs and desires, and a clearer vision for the integration of SALL into the work of the department and the goals of the institution, will all enhance the work of the SALL manager. Training in the evaluation of systems, people and materials will enhance the SALL manager’s role by improving their ability to monitor staff performance, student progress and the overall success of the learning environment. It will also encourage experimentation and innovation within the provision of SALL. Such evaluation will also aid the manager in seeking funding for SALL. 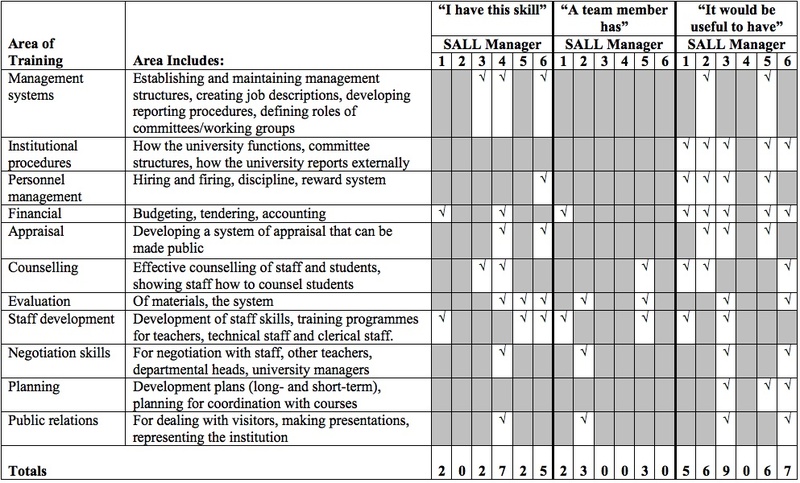 This paper illustrates, based on interviews with six practising SALL managers, that only two of the managers had formal management training and that there is a lack of relevant training opportunities; however, the managers in this study see management skills as relevant to their work and would welcome training. If SALL managers were provided with appropriate training, it would enhance the efficiency and effectiveness of SALL within their institutions. We believe that particular attention needs to be paid to the four key areas of the SALL manager’s role; that is to say, leadership, scope, expectations and evaluation. David Gardner is the associate director of the Centre for Applied English Studies at the University of Hong Kong. He has taught at secondary and tertiary levels in France, Saudi Arabia, England, Thailand and Hong Kong, and has consulted on self-access projects in Mexico and Indonesia. His research interests include computer-assisted learning and self-access learning. He is a founding member of the Hong Kong Association of Self-Access Learning and Development (HASALD). David Gardner co-authored, with Lindsay Miller, the book Establishing self-access: From theory to practice (Cambridge University Press, 1999). Lindsay Miller is an associate professor in the Department of English at City University, Hong Kong. He has been responsible for designing, developing and teaching a wide variety of courses at undergraduate and postgraduate levels. His main areas of research have focused on self-access language learning, and academic listening. He is a founding member of the Hong Kong Association of Self-Access Learning and Development (HASALD). Lindsay Miller co-authored, with David Gardner, the book Establishing self-access: From theory to practice (Cambridge University Press, 1999). Bush, T. (2011). Theories of educational leadership and management (4th ed.). London: Sage. Gardner, D. (2002). Evaluating self-access learning. In P. Benson & S. Toogood (Eds. ), Learner autonomy, 7: Challenges to research and practice (pp. 60-69). Dublin: Authentik. Jameson, J., & McNay, I. (2007). Ultimate FE leadership and management handbook. London, UK: Continuum. Morrison, B. (1999). Evaluating a self-access language learning centre: Why, what and by whom? In B. Morrison (Ed. ), Experiments and evaluation in self-access language learning (pp. 123-135). Hong Kong: Hong Kong Association for Self-Access Learning and Development. Morrison, B. (2006). Mapping a self-access language learning centre. In T. Lamb & H. Reinders (Eds. ), Supporting independent language learning: Issues and interventions (pp. 73-94). Frankfurt: Peter Lang. Mozzon-McPherson, M. (2000). 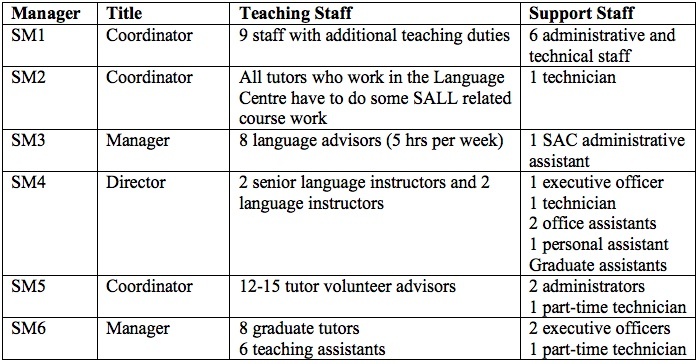 An analysis of the skills of advising and their implications on the emerging role of language learning advisers. Links & Letters, 7, 118-126. Toogood, S., & Pemberton, R. (2002). Integrating self-access language learning into the curriculum: A case study. In P. Benson & S. Toogood (Eds. ), Learner autonomy, 7: Challenges to research and practice (pp. 85-109). Dublin: Authentik. Young, J. T., Hafner, C. A., & Fisher, D. W. (2007). Shifting sands: Supporting teachers in facilitating independent learning. In A. Barfield & S. H. Brown (Eds. ), Reconstructing autonomy in language education: Inquiry and innovation (pp. 196-208). Basingstoke, UK: Palgrave Macmillan.